Themeda triandra was previously known as Themeda australis. Some publications still use the latter name. Regardless of the botanical name this widespread grass is universally known as Kangaroo Grass. Themeda triandra is a tufted perennial reaching a height of 1.5 metres with a spread of 0.5 metres. Leaves are 10-50 cm long and 2-5 mm wide, green to grey and dry to an orange-brown in summer. The flowering period is from December to February. During this time plants produce large, distinctive, red-brown spikelets carried on branched stems. 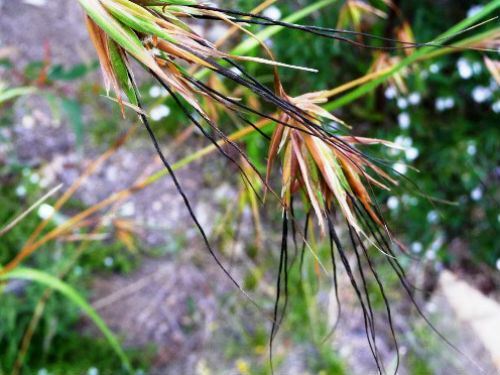 Spikelets have black awns (see image) that are retained by the seeds when shed. The spikelets make this perhaps the easiest of our native grasses to identify. This is true in our case. We find grasses, in general, particularly difficult to identify. Propagate from seed or division of older clumps. Seed is often difficult to germinate. Themeda triandra has a wide distribution. In Australia, it is found in all states and territories. Overseas it is found in Africa, Asia and the Pacific. It commonly grows in grassland and woodland communities. Kangaroo Grass was once a dominant tussock grass over much of eastern Australia but does not compete well under heavy grazing and has been out-competed by other grasses. Themeda triandra could be grown in native cottage gardens, rockeries or as a border in garden beds. Finches are fond of the seeds. Themeda triandra “Mingo” is a ground covering form with blue foliage and will reach a height of 20 centimetres with a spread of 60 centimetres.